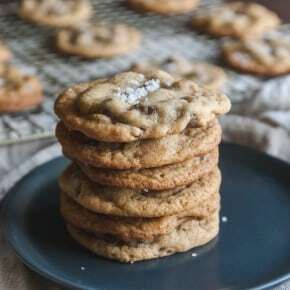 These Bourbon Salted Caramel Chocolate Chip Cookies are THE BEST CHOCOLATE CHIP COOKIES I HAVE EVER HAD! Sorry if that is in all caps, I just don’t know how else to convey the deliciousness of these cookies! What makes them so good? Well, I personally think it is the delicious caramel they are made with, Salted Bourbon Caramel from Fat Toad Farm. 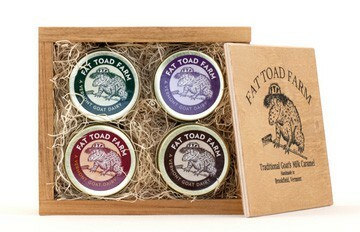 Fat Toad Farm generously sent me a wonderful ‘Toadally’ Cute gift box set of 4 caramel sauces to give away to one of the awesome Sweetphi readers, see below to enter! 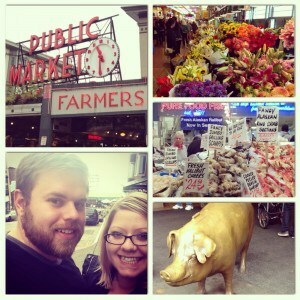 We purchased some and headed home. Fast forward a few months, I was baking chocolate chip cookies and saw the jar of caramel in my cabinet and decided to add it to the cookie dough, and the result…well, the result was so good that I emailed Fat Toad Farm and told them about how good their caramel was, and they graciously sent me the cutest little gift box for a giveaway, it even comes in the wooden box as seen in the picture above and below! I have made these Bourbon Salted Caramel Chocolate Chip Cookies 3 times already, and each time they come out as perfectly as they did the first time! I brought some over to my in-laws, and my husbands sweet little cousin had a cookie and came over to me and said ‘Phi, these are the best cookies I’ve ever had.’ How sweet is that? totally made my day, and I even was able to capture a few photos of him eating the cookies!! When making the cookie dough, you’ll add a little of the caramel sauce into the dough, and then add a little more on top before baking. After your house smells amazing and these beauties are done baking, sprinkle a little Fleur de Sel De – French Sea Salt on top, and enjoy! A little about the farm that makes the delicious caramel: Fat Toad Farm is run by a husband, wife and their two lovely daughters and is located in Central Vermont. They started out hand milking a lovely French Alpine doe named Jupiter in their garage, and seven years later are milking Jupiter’s great, great, great, granddaughter Artemis and 52 of her closest caprine friends in a modern parlor. The family has spent the last seven years building a high-quality herd of French Alpine milking goats and perfecting the art of caramel making (if you follow this blog you will know how much I admire caramel making, having burned a few spatulas in the task, and mine was nowhere near as good as the caramel sauce Fat Toad Farm makes!) 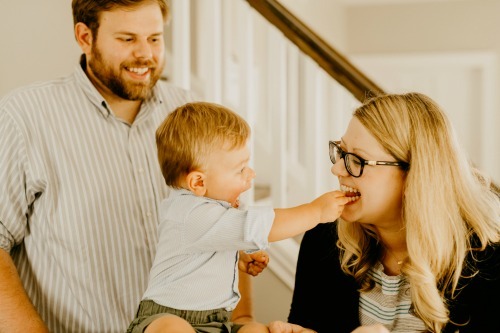 They have an variety of truly fantastic caramel sauces, and a beautiful blog with stories and delicious recipes I will definitely be checking out frequently! 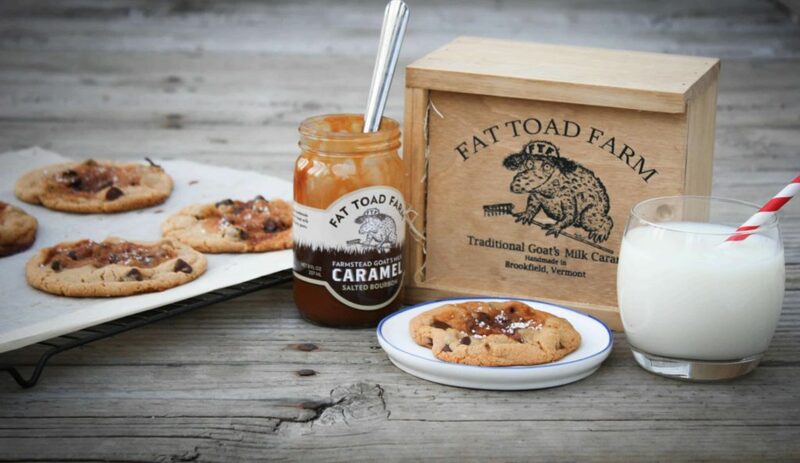 To enter the giveaway, simply sign up for the Fat Toad Farm email newsletter and leave me a comment telling me what your favorite way to use caramel sauce is (please also fill out the widget so I know you’ve entered – plus there are more entries available!) 1 Lucky winner will receive a ‘Toadally Cute’ gift box containing four 2oz jars of creamy goat’s milk caramel sauces – one jar of each of – Original, Vanilla Bean, Cinnamon, and new Salted Bourbon. Cream butter, vegetable shortening and white and brown sugar until fluffy. Scrape the sides of the bowl down. Add vanilla extract and egg. Beat until combined. Add 1/4 cup Salted Bourbon Caramel Sauce and beat until the cookie dough is a beautiful light brown color, scrape down sides of the bowl. Now, with a wooden spoon (I've heard it's very important to use a wooden spoon for this step) stir in the chocolate chips. With a spoon scoop up 1 tablespoon of cookie dough and form a ball with hands, flatten a little and press thumb in the middle to create a little well, lay on parchment paper covered baking sheet. With a spoon drizzle a little (about 1/4 tsp each) caramel sauce into the well on the cookie. 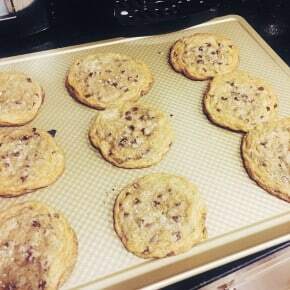 Place cookies a good inch apart as they will spread out. I got 3 cookies to a row-and 4 rows, for a total of 12 cookies per baking sheet. Disclaimer: Fat Toad Farm provided the ‘Toadally Cute Petit Jar Caramel Gift Box’ prize for the giveaway after I contacted them because I was so impressed with their amazingly delicious products. As always, all above thoughts and opinions are my own. 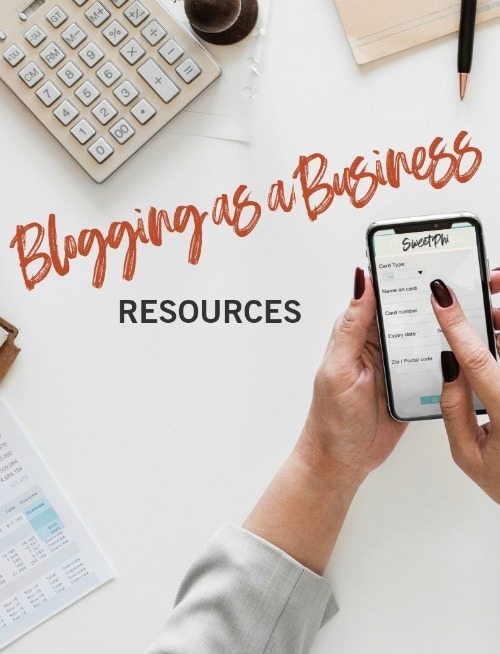 Thanks for supporting the brands and products that make the Sweetphi blog possible!